On the 24 January, 1788, Captain Arthur Phillip, R.N., steered the “first fleet” into the safe waters of Sydney Harbour, and with his eleven hundred fellow Britishers established at Sydney Cove, under his governorship, the Colony of New South Wales. During 1789 in the establishment of law and order, Governor Phillip formed a ‘Row Boat Guard’ whose primary duties were to police the harbour and foreshores of Sydney Cove to detect smuggling and to prevent the passing of letters between convicts and crews of sailing vessels, lying at anchor in the port. The ‘Row Boat Guard’ is the oldest link with any Police activity in Australia, originating the section known today as the Water Police – an essential unit of the New South Wales Police Force. 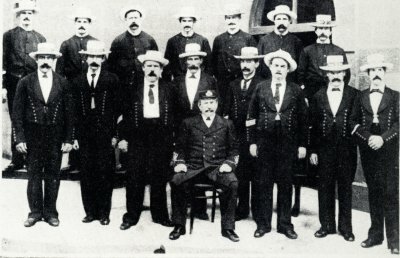 STATUS RECOGNISEDIn 1840, by special Act of Parliament, the Water Police Force was established as an official body under the control and supervision of a Water Police Magistrate. At the time the unit occupied a watch-house on Garden Island, but owing to a shortage of timber and lack of fresh water facilities, the Governor granted permission for its removal to new premises overlooking Watsons Bay. This new site was considered ideal, as all sailing ships anchored there awaiting favourable winds and tides – it also increased the difficulties of convicts unlawfully boarding such vessels and escaping from the Colony. The section expanded and by 1841 the Water Police, comprising 20 personnel, were located at three strategic points – Watsons Bay, Goat Island, and Cockatoo Island. The Army was officially responsible for all expenditure in administration and general maintenance. In 1852 the sectional strength had increased to 28 men, including two detectives – equipment consisted of three five-oared rowing skiffs, manned by five men, and a coxswain. During 1853 the Water Police, although administrated by a special Magistrate, was incorporated into the Metropolitan Police Force, the Magistrate being granted the rank of Superintendent. The section functioned under this authority until 1862, when an amalgamation of the various Police bodies, operating throughout the State were placed under the combined jurisdiction of the newly appointed Inspector-General of the New South Wales Police Force. With the advent of steam and combustion engines, the Water Police were equipped with two steam launches, the ‘Biloela’ and the ‘Argus’, the fastest vessels on Sydney Harbour. These craft were in use for about 35 years, when they were replaced by motor launches. In 1962 the fleet of the Sydney Water Police comprised of seven speedy modern launches, the “Nemesis’, ‘James F. Scott’, ‘Wm. J. Mackay’, ‘Adastrea’, ‘Typhon’, ‘Vigilant’, and ‘Osiris’. At Newcastle, there were four similar craft, the ‘Ansett’, ‘Walter H. Childs’, ‘Regal’, and the ‘Serapis’. These launches were all fitted with two-way frequency modulation radio equipment, that gave them 24 hourly communication service with radio base stations. Each launch was equipped with special rescue appliances, rocket guns, portable stretchers, first aid kits, sparklet resuscitators for treatment of the apparently drowned, and line-firing apparatus. For practical rather than sentimental reasons the section still retained one rowing boat. All Water Police launch drivers were required to pass an examination for Marine Launch Drivers and Coxswain Certificates before being appointed to this class of duty. Sydney Harbour covers an area of over 22 sq. miles and has a depth of thirty feet or more over half its area. The foreshores extend for 200 miles, and there are 22 miles of wharves serving overseas shipping, harbour ferries, and miscellaneous small craft. Patrol duties of the Water Police up to 1962, retained the original objective of the ‘Row Boat Guard’, the prevention of smuggling, to which had been added, the manifold responsibilities of protecting wharf cargoes, bonded stores, and private pleasure craft, and effecting rescue operations, not only in the waters of Port Jackson, but along the entire coastline. In the protection of life the section enjoys an enviable record. In one year alone no fewer than 396 persons were rescued by Police launches from distressed vessels, either in port or at sea. In 1927 when the liner Tahiti and the ferry Greycliffe tragically collided off Bradleys Head with the loss of 41 lives, the Water Police were responsible for rescuing 15 persons. On the occasion of the capsize of the ferry-launch Rodney in 1938, 50 persons were rescued. Each year the number of persons rescued by the Water Police from vessels in distress either in Port Jackson or at sea steadily increases. It is an impressive and imposing record of service to the community. The Water Police also closely co-operates with the Air-Sea Rescue Intelligence Organisation, a co-ordinated operation involving the Royal Australian Navy, the Royal Australian Air Force, the Merchant Shipping League, and the Civil Aviation Department, who conduct combined search operations for vessels or craft either lost or in distress at sea. 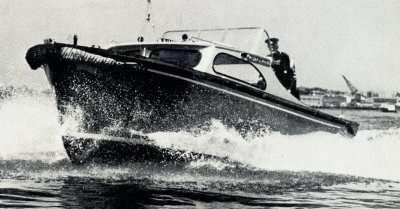 A new Police vessel, launched in February, 1962, was specially designed for this phase of search activity. The vessel was a 45 foot long ocean going craft, equipped with radar, search-lights, an automatic pilot, and echo sounding apparatus. It was powered with two 300 H.P. General Motors diesel marine engines capable of very high speed performances. The vessel had four berths, galley and saloons, enabling Water Police personal to remain at sea for lengthy periods when engaged upon difficult and protracted search missions. On the 7th March, 1962, at No. 6 Wharf, Circular Quay, the launch was presented by the Maritime Services Board to the Commissioner of Police, Mr. N. T. W. Allan, and officially named the ‘Colin John Delaney’. The Water Police are untiring and unsparing in their efforts to alleviate hardship and suffering during the ravages of floods, as evidenced during the great disasters at Lismore, Grafton, and Maitland in the late 1900’s. Profiting from those experiences the section acquired a number of late model American outboard motors capable of a speed of 17 knots, which would play a vital role in the saving of lives in future stricken areas. Those units could be transported by road to any disaster scene with a minimum of delay. 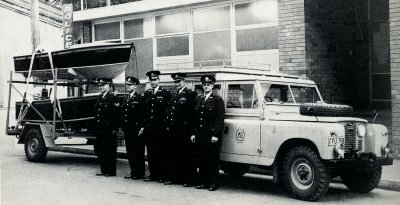 In 1955 a Shallow Water Skin Diving Unit was formed within the Water Police Branch. This unit comprised of eight specially selected personal, all under the age of thirty years, who had passed a rigid physical fitness test. 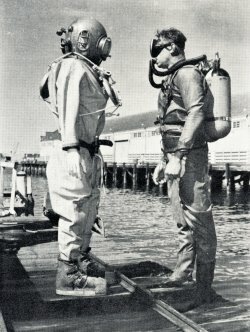 Their standard equipment consisted of rubbersuiting, face masks, and aqua-lung cylinders containing compressed air, which permitted diving operations to a depth of one hundred feet. These frogmen were used in the recovery of stolen property such as motor cycles, safes, cash registers, or Scotch whisky, from the harbour floor. They were also used in locating victims of drowning fatalities in rivers and dams throughout NSW. In the event of a long or protracted examination of any particular object on the harbour bed or ocean floor, three qualified deep-sea divers were readily available for that phase of investigation. Personal also policed the various Maritime Acts, the Fisheries and Oyster Farms Act, and attended at the scene of all accidents on vessels in port and wharf precincts. They were also in attendance at the arrival and departure scenes of all overseas liners to render assistance to passengers, and public generally, as required. The Water Police are an efficient and qualified unit of the New South Wales Police Force, performing their manifold duties with credit, and enjoying the respect of the community and administration of all authorities associated with the administration of the waters of Port Jackson.